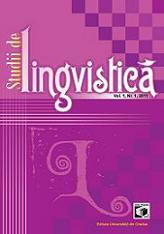 Aim and Scope: The journal Studii de lingvistică is a peer-reviewed international linguistics journal edited by researchers from the University of Oradea (Faculty of Letters), Romania. It is an annual publication which comes out in the last trimester of each year and includes articles and reviews from various fields of linguistics, in thematic issues or varia. As this journal is Open Access, full text articles are available on its website.